Summer in the city is a glorious time, mostly for getting dripped on by air conditioners and avoiding the subways, but also for foraging for edible plants and berries in Central Park. So in the spirit of summer and adventure, we decided to partake in the latter, in search of the perfect, seasonal, hyperlocal, illegal, Central Park-y salad. Wait, is making illegal salads a thing? It is! "Wildman" Steve Brill has been leading foraging tours in city parks on a regular basis since the 1980s. 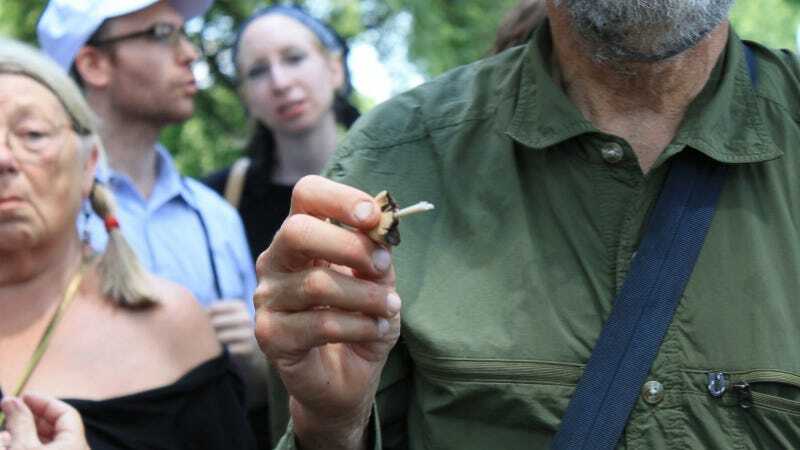 When we went on his tour this past weekend we joined a group of about 35 people who gleefully gathered the edible plants pointed out by Brill, and he mentioned that this is a pretty typical size. In 2011, The New York Times wrote that the group of foragers expanded beyond Brill and his followers to include a group of "downtown hipsters, recent immigrants, vegans and people who do not believe in paying for food." Well, cool. Should I become a foraging freegan? Two undercover urban park rangers paid Brill $40 in marked bills, infiltrated his tour and took pictures of him at work. "I even held up some freshly picked dandelions for them to photograph," Brill said. As the tour broke ended, two enforcement officers arrested Brill on a charge of criminal mischief. He was booked and whisked him to the Central Park stationhouse, fingerprinted and made to cool his heels for three hours before being given a desk appearance ticket to appear in court on April 18. Not surprisingly, this was an embarrassing episode for the Parks Department, which frowns on Brill's tours (but has not taken legal action against him). First things first: Some plants native to Central Park are poisonous, like White Snakeroot and Poison Ivy. If you are going to consume anything that grows in the park, avoid these dangerous plants, and make sure you are cognizant of allergies. Lamb's Quarters: Leafy, though Brill describes it as spinach-like. Put it in a salad? Yes. As a base. Poor Man's Pepper: The seed pod is spicy. Put it in a salad? Yes. As a seasoning. Yellow Wood Sorrel: Surprisingly sweet, like lemonade. Put it in a salad? Yes, please. Black Cherries: This reporter did not taste the black cherries after being informed by more intrepid foragers that "they were an acquired taste." Apparently, when the fruit is ripe, it *should* taste like a cherry grapefruit. Put it in a salad? Possibly, as a garnish. Epazote: This reporter (again) passed on tasting, mostly because Brill warned that the plant — often used to season guacamole — is poisonous in large amounts, and pointed out that one stalk with a handful of leaves is enough to feed a restaurant. Put it in a salad? No. Black Birch: Tastes like mint, when you chew on the twig. Brill uses it to flavor pudding, and adds that you can soak the twig in hot water to make tea. Put it in a salad? No. Better to chew on after the meal. Sheep's Sorrel: Tastes like Yellow Wood Sorrel, but even more lemonade-y. Put it in a salad? Yes! Wineberries: When ripe (i.e. red), these taste like really fresh, tangy, delicious raspberries. We were genuinely surprised to find these in Central Park. We would forage for these. Put it in a salad? Yes, this is the star of the salad. All of these amazing plants can be eaten raw, but what about plants you would have to cook or otherwise prepare before they are safe to eat? The park is full of roots and plants that require some preparation. Leaves from a Common Spicebush can be used to make tea or ground up to spice food. The Mica Cap mushroom can be cooked, sort of. Sassafras root can be used to make root beer! Cheers! And beans from the Kentucky Coffeetree can be roasted and ground to make a coffee-like beverage. Hey. Illegal salads sound like a lot of work. They are! But it might be worth it, if you're the rule-breaking foraging type. Just leaf us alone if you land in jail.